BTC City for even greener capital: with electric vehicle car-sharing spots and with environment-friendly traffic regime • BTC d.d. Two existing one-way streets in BTC City Ljubljana will be joined by two new one-way streets, along which there will be new cycling and pedestrian paths. Along with its partner Avant Car the BTC Company supports the system of car co-sharing Avant2Go, which represents a new trend of sustainable mobility. Avant2Go introduces the co-sharing of 100% electric vehicles in the scope of which the users will in the first year have 50 zero-emission vehicles BMW i3, Smart ED and Renault ZOE at their disposal on different locations in Ljubljana. Since September 2016, BTC City Ljubljana will offer four new spots, included in the system of co-sharing of electric vehicles. In order to use this service, which due to better utilisation of vehicles decreases traffic jams and pollution, the users only need to submit their driver’s license and start an app on their smartphones. BTC City Ljubljana offers its visitors 15 charging stations for electric vehicles, with 11 of them intended for co-sharing and 4 for all other visitors. Since August, the BTC City Ljubljana visitors can take advantage of 4 new one-way streets. The goal of one-way streets is to improve the traffic flow and at the same time provide our visitors with greater safety. “This is a continuation of infrastructure works which have started in May 2016 and with which the streets of BTC City Ljubljana will be given to broader use to all the traffic participants, including pedestrians and cyclists, all in compliance with the concept of a joint traffic area”, said Miha Mermal, Director of Mission: Green Business Unit in BTC Company. 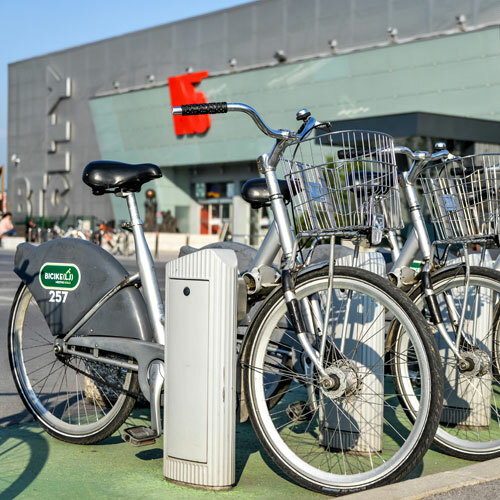 Besides the new traffic regime, BTC City Ljubljana with three rent-a-bike stands also encourages the use of environment-friendly public transport and by that contributes to less traffic jams and to cleaner air in the city. The projects of sustainable mobility point to the compliance of the BTC Company business with the global guidelines of sustainable mobility, as well as to its support of the efforts of the City Municipality of Ljubljana in light of sustainable development in the scope of the project European Green Capital 2016. The BTC Company combines all its environmental and socially responsible projects within the Mission: Green pillar. On top of that, in autumn 2016 the Company has joined all such projects within BTC City in its campaign Mission: Green City. Over the last 15 years, the Company has invested 48.9 million Euros in the Mission: Green projects, as investments in environmental and socially responsible projects bring positive effects and show themselves in innovative approaches and a successful and dynamic growth of the company. The business pillar Mission: Green comprises four fields: environment protection, green energy, energy efficiency, and social responsibility. The sustainable efforts of the BTC Company are realised in partnership with numerous stakeholders with which the Company additionally increases the positive effects on behalf of the society and the environment. Every carried out project realises the BTC Company’s Development Strategy 2020, which puts sustainable development in the centre by seeking opportunities for green economy and for encouraging innovativeness.